The results are in and the news continues to get worse for the nation’s largest department stores. Words like “dismal” and “crushing” have been tossed around this month to describe holiday sales at the Macy’s and Kohl’s of the world, and they’re well-earned descriptors. November and December 2016 same store sales were south of 2015 numbers at four of the five companies at the top of the charts in Chain Store Guide’s Database of Department Stores and Shoe Retailers. The exception is Nordstrom, only because it opts not to publicly report holiday sales outside of the standard quarterly earnings cycle (which comes around again in mid-February for the company). Smart money says the results will be less than spectacular. 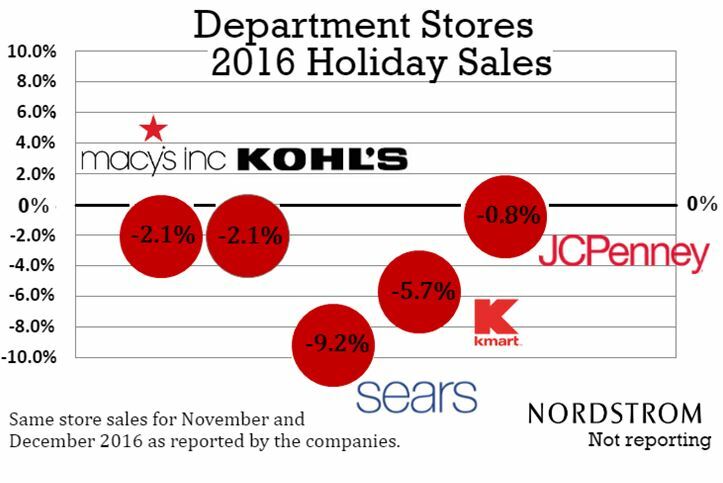 We’ve pulled together November and December same store sales for Macy’s, Kohl’s, Sears, Kmart and JCPenney in the chart below. The figures represent company-wide sales for each of the entities, with the exception Sears and Kmart as Sears Holdings released separate sales figures. Sears and Kmart may be lost causes – and it won’t be this one holiday season that does them in. But for the others the challenge continues to be right-sizing store counts and rapidly growing digital sales from a small base to mitigate the effects of what many believe is a permanent shift in consumer traffic. And if you have the magic bullet to help turn some of these department stores around, we have the contacts you need – our Database of Department Stores and Shoe Retailers contains more than 500 buyers and decision makers for the companies detailed in the chart alone.